The brand of "Oliver" has definitely spread far and wide since the first few days that his face appeared on the Naked Chef. I remember fondly the day that he brought a different kind of energy to the TV screen and I always waited intently for what next week would bring. Not everyone's cup of tea, but I have always been a fan. A couple years down the line, he has spawned multiple tv series, crusades and the restaurants. Some might say, he's done pretty well for himself. 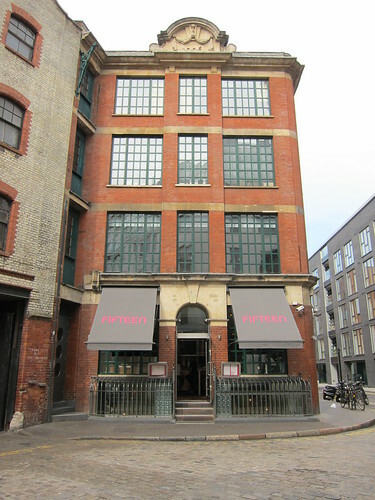 Fifteen was Jamie Oliver's first restaurant venture and is still going strong. Having eaten in the trattoria before, I can vouch for the food, and the pasta in particular. As you can imagine, the restaurant draws it's inspiration from Italy, embracing great ingredients cooked with minimum fuss. 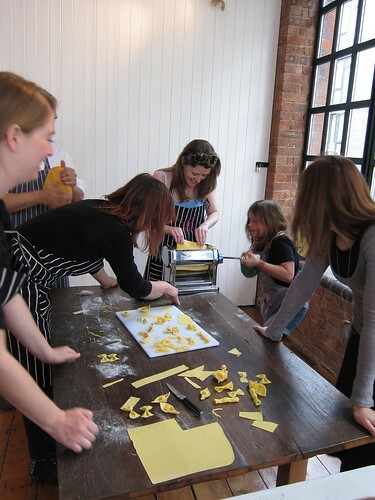 When Yell.com asked me if I would like to join them at a pasta making class, I donned my apron and chefs hat and headed to Old street to make pasta. 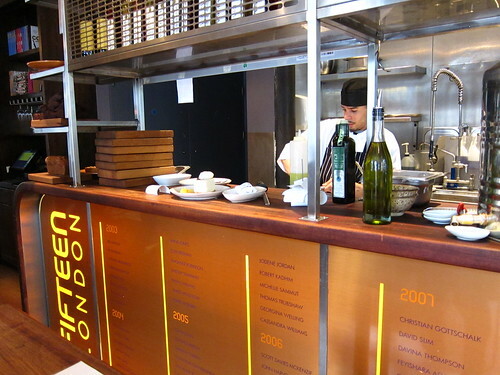 Many of the chefs at Fifteen are trained on site and are all part of Fifteen's apprenticeship scheme. What was borne from a TV show all those years ago now churn out capable and passionate chefs every year, giving those who sign up another chance. Taking the class was Dean, head pastry chef at Fifteen and ex graduate from the scheme, with a current trainee to assist. Dean embodies everything that the apprentice program tries to give it's students. Having been a bit of tearaway at school, getting into trouble and joining a circus when we was a teenager, he joined the apprentice program and in his own words, it turned his life around. Now he has become the head pastry chef, has settled down with a family and kids and is looking at working on his cakes and pastries future. A pretty good success story, I'm sure you will agree. 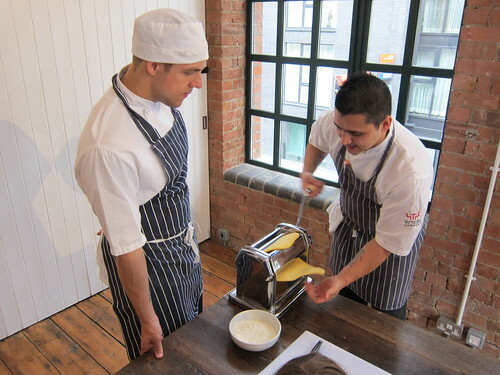 The pasta making course itself was a lot of fun. With the ingredients all weighed out and ready before us, we got our hands into our bowls and kneaded away at our dough. As much as you can garner from a book, you can't beat the advice straight from a chef who makes pasta every day. After kneading our dough and put them away in the fridge, we started to work on some pre prepared dough, rolling it out into ravioli and other shapes. 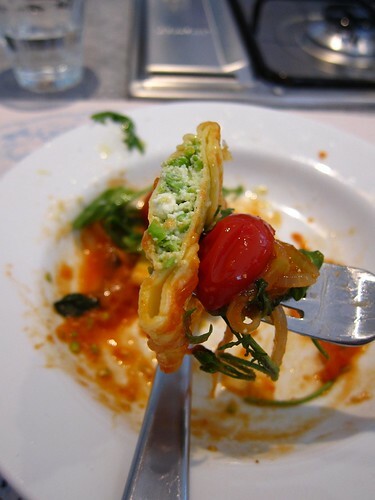 The ravioli were filled with a baked ricotta and pea filling prepared earlier and cooked with a simple "sofrito" of tomato, onion, basil and garlic. It was absolutely delicious. We left the class with boxes of pasta to take away for our dinner, and a great time was had by all. Spending some time with the chefs at Fifteen reinforced my view of the programme. Good food and a chance to give people a better life. I think that is what you call a "Win Win" scenario. I was invited as a guest by Yell.com. There are no paid classes at the moment, but there may well be in the future. For more pictures from the day and of my previous visit to Fifteen, click here. We dropped by Fifteen for dinner some time back and what left a deep impression on me was not the food but rather a small pamphlet that was left at every table. In it, Oliver wrote about the motivation behind Fifteen and that most of its staff were from families with less opportunities. Well, kudos to him for his movement (I would call it that!). I'm a huge fan of Jamie's - I've been watching him since he first appeared on TV, cooked numerous recipes from his books and am shouting in outrage at the injustice he's encoutering in the US for his Food Revolution at the moment. However I think Fifteen has gone slightly downhill. I first went about 3 years ago and absolutely loved every mouthful - it felt so fresh and new. 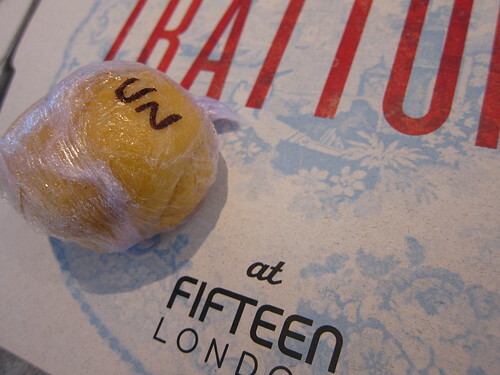 Last year, we returned for my boyfriend's birthday and experienced bad service, fatty meat and a real disappointment. This post suggests they're still doing great things and the food looks lovely - maybe they were just having an off day. I love Jamie! Funny - how they spelled your name: UN - I get that!